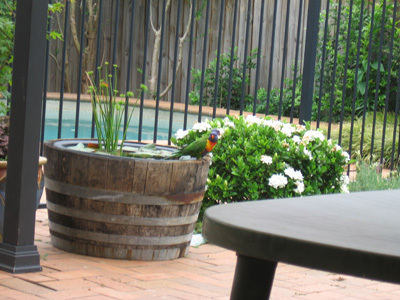 Never before have we seen rainbow lorikeets in the backyard – they certainly live in the bush nearby. Perhaps it is the promise of a fine feast of sultana grapes swelling on the vine adorning one section of the pergola that drew them in. Today, they were happy to pick at bird seed in the suspended feeder and grab a drink from the barrel water garden.We had only just installed a wireless video camera above the feeder so we were thrilled to be able to view our visitors up close. At this stage the camera feeds to the TV but we hope to have Bird Cam to computer in the near future. We managed to quickly grab some video footage by pointing a digital camera at the TV. Unfortunately our ” Bird Cam” blew up soon after this movie was taken. Many things have changed since then. We moved the feeder away from under the pergola due to the continual bird mess from seed and droppings – the mess encouraged the cockroaches! Poor Galahs were still looking for the feeder under the pergola over a year later and seem unhappy with the current position hanging from a tree in the garden.